In The Lead – Aux Armes, Citoyens! The electoral ouster of French President Sarkozy sent the euro into quite a tailspin on Sunday evening and that development helped the US dollar push aggressively towards the 80.00 mark on the trade-weighted index. The breach of the $1.30 level against the greenback by the sliding (to a three-month low) euro made the opening quotes in precious metals fall into the red column fairly swiftly. Declining metals prices were accompanied by a near 3% fall in the Nikkei Average, a slide in crude oil to four-month lows, and by a generalized retreat in risk-taking sentiment. Spot gold bullion traded at lows near the $1,635 level in Sunday night trading, while the news from Paris also engendered bid-side quotes at near $29.90 for silver. 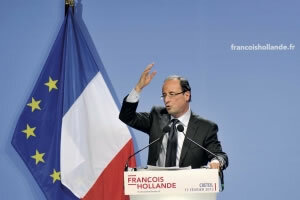 Considering the fact that the second largest economy in the EU has just been handed over to Socialist control (for the first time in 17 years), and that the advent of Mr. Hollande’s tenure is likely to give rise to deeper rifts with previously stated German economic and budget deficit policies, the damage to the euro was relatively contained. Albeit somewhat more stable, the metals markets opened to the downside in gold and in silver and with modest advances in platinum and palladium on Monday morning in New York. The action reflected a decline in the US dollar after last night’s surge to the round resistance level and the return by the euro to a level just above the $1.30 pivot point. Spot gold lost $5 on the open to start the new week with a bid at $1,637 the ounce. Silver fell 20 cents to the $30.14 mark per ounce. Platinum climbed $5 to $1,528 while palladium rose $2 to $651 the ounce. No changes were noted in rhodium at $1,350 per ounce. In the background, crude oil was hovering under the $98 level per barrel down about 0.75%. The most recently available CFTC positioning reports indicate that net speculative length in the yellow metal remains feeble amid lacking bullish confidence. In silver, the longs shed some more tonnage but so did the shorts, which could at first blush appear positive. However the substantially large short position of nearly 1,600 tons continues to reflect a similar lack of confidence in the white metal’s ability to stage a serious recovery and is, in the words of analysts at Standard Banks (SA) "a cause for concern." Platinum speculators built up hefty new long positions but their move was still being countervailed by a relatively sizeable short position being held by similar players who hold opposite convictions. Palladium positioning continued to improve but the longs still have some way to go before they can convince more players that there is cause of favoring platinum’s close relative in terms of a short-to-medium term play. Most analysts concur with that view as certain car markets, despite being slower than they were last year, continue to consume robust amounts of the noble metal. Consider for a moment, the fact that a new car hits the road in China every 2.3 seconds (!) on average. Palladium is indispensable in that process. That said, commodity speculators do get it wrong, on more than just one occasion. For example, as a group, hedge funds lifted their bullish commodity bets for the first time in a month-and-a-half just prior to the complex experiencing its largest… drop since last October. Oops. Meanwhile, investors pulled $357 million out of commodity funds by last Wednesday and they pulled $349 million out of precious metals. 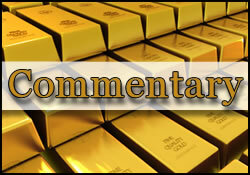 "lagging gold shares have been the albatross following the great post-millennium gold bull market. Gold stocks have historically been tremendous money makers in bull markets and a rebound has been several times forecast." Frankly, we have lost count of how many "several times" represents at this juncture. But, one of these days, who knows? "This disconnect has caused a large discrepancy between the gold spot price and the implied valuation of gold through gold equities." On the physical front in gold, the only encouraging news to hit the wires of late has been the removal by the Indian government of the excise tax of 0.6% on non-branded jewelry that had gone into effect on March 16 and which caused a massive strike among that country’s bauble sellers. Finance Minister Mukherjee however left a proposal to double the import tax on gold to 4% on the table. Would-be Indian buyers have to already cope with record (near-30,000 rupees per 10 grams) local gold prices. Consider the metric that reveals that gold demand in Mumbai is currently running at around 250 kilograms per day as opposed to as much as the one metric tonne per day that was apparently being consumed one year ago. This "love trade" has, indeed, been jilted. Finally, on the analytical and valuation front for gold, we heard from former Kitco commentator and veteran market observer Paul van Eeden. One of the most dispassionate and cogent gold market analysts to date, the President of his own private holding firm, Mr. van Eeden has recently tendered that the real (as opposed to nominal) value of gold lies somewhere in the vicinity of $890 an ounce. That figure is eerily close to the "fair value" number of $878 currently being tracked by another veteran gold market analyst, Mr. Ned Schmidt. Having correctly predicted the rise in gold to the four-digit spectrum as well as the correction to the high $600s that followed in 2008, Mr. van Eeden’s perspectives are not to be dismissed out of (perma-bullish) hand. It could just turn out to be the case that this Sunday marked a pivotal point in the growing danger of an eventual dissolution of the common currency. Certain voters in certain countries have indicated that they are less than amenable to accepting what they see as the terms of a new, this time, German "diktat" on matters economic, and they have sent a clear signal to Berlin as to where they stand. We do not hold out hope for the reaction of the financial markets to be very positive about such body language, to say the least. The rise of the "marshmallow man" and the ouster of the "president of bling-bling" could have ramifications which have not yet been pondered. One such potential fallout involves bankers and the wealthy in France. However, France was not the only place where euro-unfriendly news issued forth from. Greek voters flexed their own political muscles over the weekend and the result was a categorical rejection of austerity measures and an overwhelming approval of anti-bailout ones. The bottom line is that in the wake of the financial crisis that shook the continent, the continent appears to have taken a turn into a direction that is undeniably classifiable as "the left." The barricades have been erected. All that remains to be seen is whether the equivalents of Messrs. Robespierre and/or Karaiskakis in the incarnation of Messrs. Hollande and/or Tsipras will make a name for themselves in these modern-day upheavals. In The Lead – NEUrope!